Professor Tony Nader, M.D., Ph.D., has discovered the precise one-to-one relationship between the fundamental structures and functions of human physiology (individual life) and the fundamental structures of Natural Law (cosmic life). The fundamental structures of Natural Law connect individual intelligence with cosmic intelligence—the basic structures of the human nervous system with their ‘cosmic counterparts’. 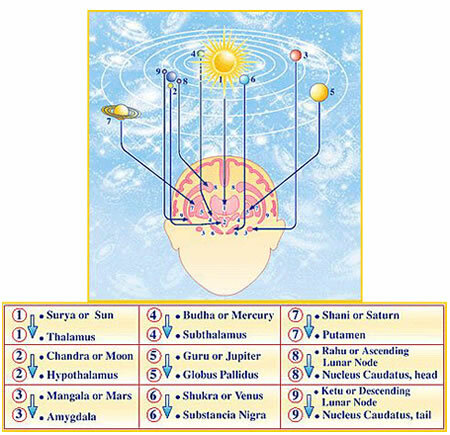 This illustration from Professor Nader’s book, Human Physiology, Expression of Veda and the Vedic Literature, presents a coronal section of the brain with its internal structures, and their one-to-one relationship with the nine ‘cosmic counterparts,’ the nine Grahas (planets). To request a Maharishi Jyotish Consultation, please see the instructions on the Services tab. For a more complete introduction to the fundamental principles of the Maharishi Jyotish program, please proceed to The Grahas, Rashis, and Nakshatras at the Time of Birth.